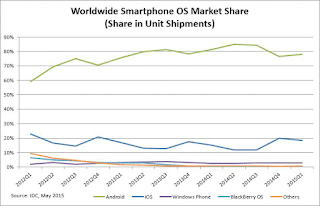 No doubt Android powered Smartphones are in majority at present. According to a survey Android is dominating the market with around 78% share while iOS is lacked behind with 18.3% shares only. If you'll ask about the data of Windows phone and blackberry then I would suggest you to not ask as it's negligible when compared to Android. Since past few years Android has covered the whole Smartphones industries and keep on growing still. You can easily notice Android started growing in the first quarter of 2012 and since then it's rising continuously. You all know very well that Play Store is the attraction point of this fastest growing OS. According to a rough estimate there were more than 1.4 millions apps present in February 2015. Not all the apps such as softwares, games are free of cost. You'll find most of them at no cost but they would contain advertisement. It's only because developers wanna earn some bucks. You'll have to purchase pro version of the apps to get rid from ads. 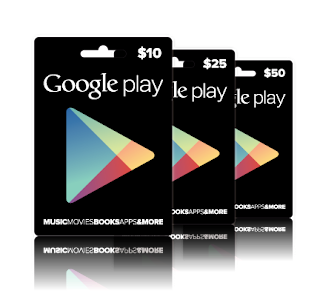 You can do that with your Google play credits. But wait! you can't get Google play credits in free. In order to get them you'll have to spend real money. But don't worry we won't let you spend a single penny. 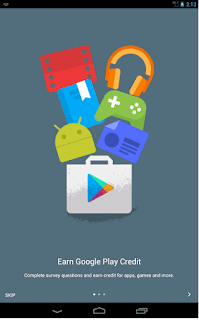 There's a method to earn Google play store credits for free. Yeah! 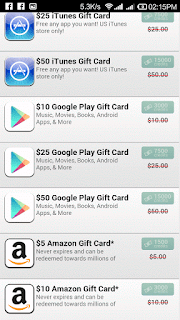 I said it right, perform just a couple of work and get play store credits, gift cards. Further you can use them to purchase apps, games, books and movies too. We've mentioned 2 methods below you can use them according to your country as these are not available for all countries. 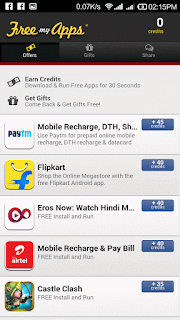 Below are the top most apps offering Google play store credits. It's an official app from Google developed by Google Consumer Surveys. You'll earn credits on completing some surveys. Those surveys include some simple to answer questions such as "Which logo is best? ", "Which promotion is most compelling?" or "When do you plan on traveling next?". Quiet simple these are? Yes they are. 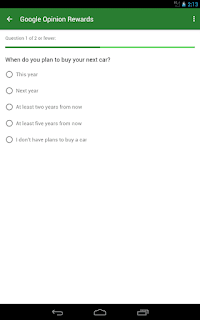 Google will send you surveys on weekly basis. But you can get them sooner too. You don't have any need to open it daily for the survey notification. Google will do this for you, once a relevant survey is ready, it'll show up in the notification bar of your phone. The sad thing about this app is that it's not available for all the countries. Only some selected countries such as US, UK, Mexico and Brazil can avail benefit. But they keep up adding more countries to their list. Head to the Play store then search and install Google Opinion Rewards. Launch it on your Smartphone. For the first time you'll see introduction window, you can skip it easily. On completing your profile you'll be taken to the main menu where you can see the available surveys. Whenever a survey is ready, you'll be informed for it. Some simple to use questions will' be asked, answer them to complete the survey and earn credits. Note: - You may need to wait for at least week to receive your first survey. Start your play store then search and install FreeMyApps (bonus coins for completing an offer from the app for first time). You can sign in only with your Facebook account. This is to make sure that you're a real person and not a bot. They don't post on your wall. If you don't wanna use their services any more then you can disable connection between Facebook and freemyapps. So this was all about how to get free Google play store credits. These were some of the genuine ways to earn. You can found hundred more but they can be spammy too. You might don't receive any credit on completing offers. If you've any doubt or query then feel free to leave a comment below in the comment section. Wait for some more time. It's a genuine service from Google. So you would receive it shortly for sure.